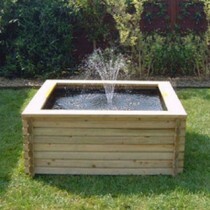 Have a look at our range of water features from pools to wishing wells, we have the perfect addition to your garden. Our selection of wishing wells are sure to add interest and charm to your lawn. Norlog’s Flatback Wishing Well, fits tight up against any flat structure so is ideal for a smaller lawn or even a balcony. Or if you’re looking to house some aquatic creatures we have a wide range of pools varying in shapes and sizes, within our range there will be a pool to suit your garden. Alternatively, add the Bermuda 1000 lph pump to create a beautiful fountain display in one of our pools. We also offer the classic and traditional Two-tier water feature made from recycled whisky barrels.